The film will not take place directly after the events of “The Last Jedi,” director J.J. Abrams said Friday during the “Star Wars: Episode IX” panel at the Chicago event. She is carrying his hand-me-down lightsaber, now mended following the events of “The Last Jedi,” and staring down the barrel of Kylo Ren’s TIE fighter in a desert. Through several cuts we see characters from the previous two films in the newest “Star Wars” trilogy as well as returning favorites such as Billy Dee Williams as Lando Calrissian. The trailer wraps with ominous theme music and cackling laughter. It is likely the voice of Emperor Sheev Palpatine. Once the trailer was shown at the panel, Ian McDiarmid, the actor behind the iconic villain, appeared from backstage telling the tech team to roll the clip again. 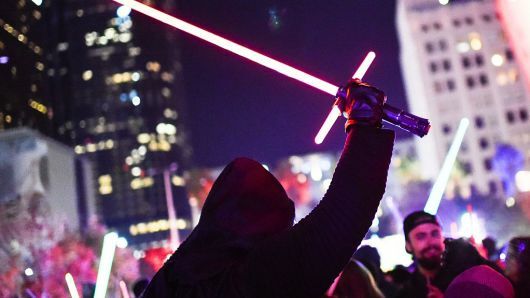 “The Rise of Skywalker” is the final installment in the nine-film “Star Wars” saga centered around the Skywalkers. Not much is known about the plot of the film, only that some time has passed between the second and third installments in the most recent trilogy. Daisy Ridley, John Boyega, Kelly Marie Tran, and Oscar Isaac have returned to reprise their roles as Rey, Finn, Rose and Poe, members of the resistance. Adam Driver and Domhnall Gleeson also return as Kylo Ren aka Ben Solo and General Armitage Hux, leaders of the First Order. Joonas Suotamo, who took over the role of Chewbacca from Peter Mayhew for the last four “Star Wars” films, will also be featured in the film. Naomi Ackie will take on the role of newcomer Jannah. During the panel, Ackie dodged questions about whether this character was related to Lando Calrissian. “Lando is a very charming man, so he could have children all over the universe,” Ackie said. The late Carrie Fisher also appeared in the trailer. Unused footage from “The Force Awakens” has been repurposed to give her character Leia Organa more scenes within the film. Abrams said that CGI was never an option for extending her presence in the film.